There has been a lot of talk about the 1869 Argentina census, and it's pending FamilySearch Indexing project; however, many people don't know about the superbly detailed 1855 Buenos Aires city census. 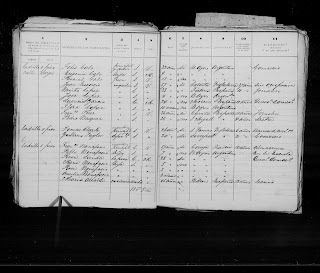 The 1869 and 1895 national census records for Argentina are wonderful finding aids for researchers. Both list all members of a given family along with age, gender, and where they were born. The birthplace information provided in these two censuses includes: 1) province if born in Argentina or 2) country if born outside of Argentina. That's where the 1855 census trumps both of them. ¿En donde nacio? - This column (#8 - click on image to see larger version) usually gives the town or region where the individual was born. I've looked at hundreds of these images and found towns mentioned in: England, Ireland, Austria, Germany, Italy, Portugal, Spain, India, etc. ¿De que país es? - This column (#9) provides the country where the individual was born...no big surprise. Si extranjero, que tiempo hace que esta en el país? - This column (#10) provides the number of years (or months) the individual has been in Argentina. This information gives you a pretty accurate time period of when the person immigrated (census information may be incorrect).